Do you suffer from allergies or asthma? It’s a little-known fact that these two conditions are directly linked to each other. Asthma, which affects roughly one in 12 people according to the CDC, is characterized by spasms of the small airways and inflammation. Furthermore, about 90% of children under the age of 16 with asthma have allergies, while 70% of people between the ages of 16 and 30 have allergies, and 50% of adults over the age of 40 have allergies. Unfortunately, most people who suffer from allergies and asthma simply mask their symptoms with drugs rather than seeking a treatment for the root cause. 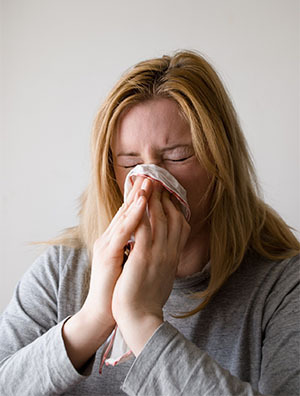 Both of these conditions involve an overreactions by the body’s immune system to what it believes is a foreign invader. When you are exposed to an allergen (e.g. ragweed, pet dander, etc. ), your immune system produces and abundance of inflammatory hormones, which subsequently cause the symptoms of allergies and asthma to manifest. There are several alternative treatment options available for allergies and asthma, however, one of which is making dietary and lifestyle changes. We live in age in which far too many people choose to pick up convenient fast food as opposed to preparing and cooking fresh meals. There’s nothing wrong with an occasional fast food burger, but basing the bulk of your diet around processed foods such as this will take a toll on your body. The lack of nutrients and increased intake of preservatives can disturb the immune system, causing greater sensitivity to allergens. A better choice is to consume a diet rich in lean meats, fresh fruits and vegetables, and whole grains. Acupuncture is also known to improve the symptoms for allergy and asthma sufferers. This Traditional Chinese Medicine (TCM) involves stimulating the body’s life force (Qi) by placing small, thin needles directly under the skin. When a person’s Qi grows stagnant or experiences other problems, he or she is more susceptible to disease and illness. Therefore, correcting this problem through acupuncture will naturally deter allergies, asthma and other common problems. This article was posted in Herbal Medicine, Traditional Chinese Medicine and tagged acupuncture, allergies, asthma, herbs. Bookmark the permalink. Follow comments with the RSS feed for this post. Both comments and trackbacks are closed.